How does anyone become a prolific writer? How do artists get their work to hang in the MoMA? If you have an idea for a creative business, how do you make that a reality so you can quit your dull day-job and spend your life doing what you love (or, at least, think you love)? The answer in each case is easy to say but difficult to follow-through: just start. Hear me out. I often hear from budding creative individuals that they want to do more or start something but can’t get over wondering about how to go about it. They feel stuck, like they’ve hit a dead-end before they’ve even begun. The feeling is understandable, I feel it any time I start a new project myself (believe it or not). When I self-published my first book I had nobody to hold my hand through the process, I had to figure out how to do it all on my own. When I launched Creative Something nobody told me what to write, or how often to write, or how to get nearly 100,000 people interested in what I have to say. But here I am, nearly seven years later. Believe it or not: I’m still figuring it out. And that’s the thing: nobody who has ever become a successful writer, or who has work hung in the Museum of Modern Art in New York, or who has started their own business, has any idea what they’re doing. They don’t. I don’t. We absolutely don’t. This is an immensely personal topic for me, one that I get very frustrated with when I hear someone in my life say “I want to start this thing” and then they do nothing about it. Daydreaming is fun, but I don’t want daydreamers in my life. I want people who do something with their ideas. 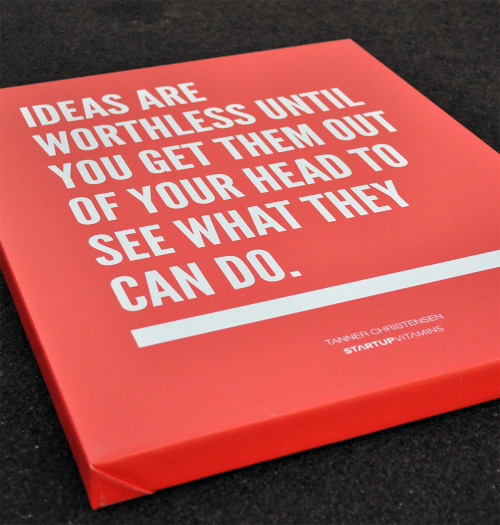 After all, ideas are worthless. So how does anyone do it? How do people write books, create masterpieces, start businesses, and create a name for themselves? We just do it. And what a load of crap that sounds like. But it’s true! To become a successful artist, to produce a hit play on broadway, to start your own business, to create a world-famous blog, all involves doing it however you can. The key difference between people who do those things and those who dream of doing those things is that the people who do them simply do it. They put one foot in front of the other, guess what step comes next, and pray it’s a good one. If you want to write a book, for example, the first place you should start is by writing some words down. It seems obvious, but the tendency is to first worry about how to contact a publisher, or what the cover art will look like, or what to title the book, or what format the book needs to be in. But all of those things don’t matter if you don’t have any words to fill the pages. What then? Let’s say you want to be a writer and you’ve written a few thousand words, now what? It’s scary to think about, right? It’s true! One option is to find someone on Twitter, Google, or LinkedIn who has done what you want to do before and ask them what they did to get where they are. The Internet gives you access to thousands of people who have already done what you want to do. I’m sure if you emailed 30 of them, one will get back to you with an idea on what you can try next. But don’t just sit there wondering what exactly to ask or who to ask or what they might say in response. Just do what the job requires: ask. You could alternatively use Google to research what you want to do and find already-published answers out there in the world. There are billions of people around the world, millions of which have likely done something similar (if not exactly) to what you want to do. Hundreds of thousands of them are probably online, and thousands of those people are likely to have written a little something about their experience. Seek them out, you’ll find what you’re looking for if you try. And that’s the thing: you have to put some work into the process to get momentum. You may not find the exact answer you’re looking for, and that’s ok. The reason people who take the risk to start a business, who quit their day job to pursue the life of an artist, who open the doors to their own shop, the reason they stand apart from everyone else is because they faced the fear of not having the slightest clue about what they’re doing…but doing it anyway. In the end, the only way to be creatively successful is to start, to keep going, to make mistakes and learn from them, and then keep going. If you were looking for an easier answer then you’re going to be in for a real brutal shock: there isn’t one. You have to start the work, you have to do the work, and you have to play a guessing game the entire way. But trust me when I say it’s worth it. Guess, try something, and if it fails you’ll find you’re alright. You just dust yourself off, eat a pint of ice cream if you have to, and try something else.